During the Commonwealth period Organs were removed from both College ad Parish Churches, the Instruments were both sold , hidden or partially and totally destroyed. An ordinace dated 9th May 1644 prohibited music in divine worship except for the singing of psalms and stipulated "that all Organs the frames and cases wherin they stand in all Churches and Chappels aforesaid shall be taken away and utterly defaced." With the restoration however enthusiasm for Organs "revived in a bewildering burst" and it became a matter of prestiege to dignify sanctuaries, meeting places and even homes with them." One Organ built in 1637and initially housed in Magdelen College Oxford, evidently escaped the 1644 ordinace and was moved to Hamptonn Court Palace by Order of Oliver Cromwell sometime between 1654 and 1660. Milton according to tradition played on this Organ. As one early biographer , John Aubrey recorded, "Milton had an early Organ in his house, he played on that most ". It is know that Milton took his organ from house to house. The original painting was one of a pair originally exhibited together at the 1858 Munich Exhibition. The pair to this painting (now lost) was titled " The first soiree of Charles II at Whitehall " which showed Charles II as the central figure in the composition surounded by his court dressed in sumptious court dress and with a general relaxed deportment and frivoloity. In this Painting the figure of Cromwell sits in a circle of family and courtier spectators around the figure of John Milton playing at the Organ, his face and body almost devoid of detail within the shadow that envelops him. The shadow contrasts the bright illuination that is cast elsewhere. Nobody looks at Cromwel thus providing an interesting contrast to the paiting of Charles II's court at the restoration. John Milton, (born December 9, 1608, London, England—died November 8?, 1674, London? ), English poet, pamphleteer, and historian, considered the most significant English author after William Shakespeare. Milton is best known for Paradise Lost, widely regarded as the greatest epic poem in English. Together with Paradise Regained and Samson Agonistes, it confirms Milton’s reputation as one of the greatest English poets. In his prose works Milton advocated the abolition of the Church of England and the execution of Charles I. From the beginning of the English Civil Wars in 1642 to long after the restoration of Charles II as king in 1660, he espoused in all his works a political philosophy that opposed tyranny and state-sanctioned religion. His influence extended not only through the civil wars and interregnum but also to the American and French revolutions. In his works on theology, he valued liberty of conscience, the paramount importance of Scripture as a guide in matters of faith, and religious toleration toward dissidents. As a civil servant, Milton became the voice of the English Commonwealth after 1649 through his handling of its international correspondence and his defense of the government against polemical attacks from abroad. Oliver Cromwell, (born April 25, 1599, Huntingdon, Huntingdonshire, Eng.—died Sept. 3, 1658, London), English soldier and statesman who led parliamentary forces in the English Civil Wars; he was lord protector of England, Scotland, and Ireland from 1653 to 1658 during the republican Commonwealth. Cromwell, Oliver As one of the generals on the parliamentary side in the English Civil War against King Charles I, Cromwell helped to bring about the overthrow of the Stuart monarchy, and, as lord protector, he raised his country’s status once more to that of a leading European power from the decline it had gone through since the death of Queen Elizabeth I. A man of outstanding gifts and a forceful character, he was one of the most remarkable rulers in modern European history, for although a convinced Calvinist, he believed deeply in the value of religious toleration. At the same time Cromwell’s victories at home and abroad helped to enlarge and sustain a Puritan attitude of mind, both in Great Britain and in North America, that continued to influence political and social life until recent times. Emanuel Gottlieb Leutze (May 24, 1816 – July 18, 1868) was a German American history painter best known for his paintingWashington Crossing the Delaware. He is associated with the Düsseldorf school of painting. Leutze was born in Schwäbisch Gmünd, Württemberg, Germany, and was brought to the United States as a child. His parents settled first in Fredericksburg, Virginia, and then at Philadelphia. His early education was good, though not especially in the direction of art. The first development of his artistic talent occurred while he was attending the sickbed of his father, when he attempted drawing to occupy the long hours of waiting. His father died in 1831. At 14, he was painting portraits for $5 apiece. Through such work, he supported himself after the death of his father. In 1834, he received his first instruction in art in classes of John Rubens Smith, a portrait painter in Philadelphia. He soon became skilled, and promoted a plan for publishing, in Washington, portraits of eminent American statesmen; however, he met with but slight encouragement. In 1840, one of his paintings attracted attention and procured him several orders, which enabled him to go to the Kunstakademie Düsseldorf, where he studied with Lessing. In 1842 he went to Munich, studying the works of Cornelius and Kaulbach, and, while there, finished his Columbus before the Queen. The following year he visited Venice and Rome, making studies from Titian and Michelangelo. His first work, Columbus before the Council of Salamanca was purchased by the Düsseldorf Art Union. A companion picture,Columbus in Chains, procured him the gold medal of the Brussels Art Exhibition, and was subsequently purchased by the Art Union in New York; it was the basis of the 1893 $2 Columbian stamp. In 1845, after a tour in Italy, he returned to Düsseldorf, marrying Juliane Lottner and making his home there for 14 years. Leutze also executed other portraits, including one of fellow painter William Morris Hunt. That portrait was owned by Hunt's brother Leavitt Hunt, a New York attorney and sometime Vermont resident, and was shown at an exhibition devoted to William Morris Hunt's work at theMuseum of Fine Arts, Boston in 1878. In 1860 Leutze was commissioned by the U.S. Congress to decorate a stairway in the Capitol Building in Washington, DC, for which he painted a large composition, Westward the Course of Empire Takes Its Way, which is also commonly known as Westward Ho!. Late in life, he became a member of the National Academy of Design. He was also a member of the Union League Club of New York, which has a number of his paintings. He died in Washington, D.C., in his 52nd year, of heatstroke. He was interred at Glenwood Cemetery. At the time of his death, a painting, The Emancipation of the Slaves, was in preparation.Leutze's portraits are known less for their artistic quality than for their patriotic emotionalism. 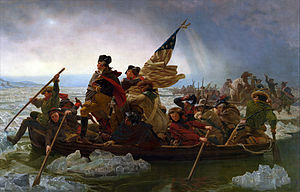 Washington Crossing the Delaware firmly ranks among the American nationaliconography, and is thus often caricatured.